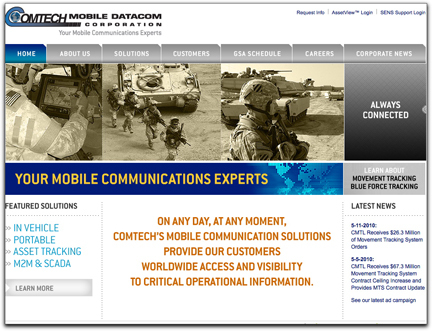 Comtech Telecommunications Corp.'s (CMTL 32.39, +0.52, +1.63%) subsidiary, Comtech Mobile Datacom Corporation, received a $140.5 million ceiling increase to its existing Blue Force Tracking ("BFT") program contract with the U.S. Army. The total contract ceiling is now $384.0 million, for which Comtech has received orders to date totaling $234.4 million — the Company's existing BFT contract expires in December, 2011. The ceiling increase enables Comtech to continue to provide BFT-1 mobile satellite transceivers, satellite bandwidth, satellite network operations, engineering services and program management support to the FBCB2-BFT program, a battle command real-time situational awareness command and control system. Comtech Mobile Datacom Corporation is engaged in the provision of satellite-based packet data communication systems and location and messaging services through the use of advanced communication and network technology.